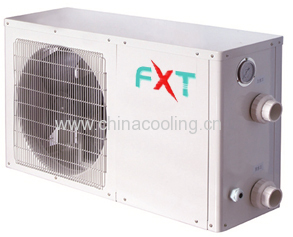 ◆ Adopt Titanium heat exchanger , effectively erosion proof and durable. ensure they work in high Efficiency and longer life. ◆ High COP TOSHIBA,HITACHI Heat Pump Compressor ,fan motor , quiet ,green,less-pollution and longer life,Lower noise level. ◆ Multi Rows evaporator with, inner-grooved copper pipe and ,hydrophilic aluminum fins which could reducing drag,and the surface not easy to bear water. ◆ Automatic defrosting function,Flow switch for Water flow Protection. ◆ Multiple protection and query function and self defrosting. ◆ Applicable to Swimming pool Heating ,Cooling function Optional. Heating Measuring conditions(1):Ambient temp DB/WB: 24°C/19°C,Inlet/Outlet water temperature:26°C/28°C. Heating Measuring conditions(2):Ambient temp DB/WB: 15°C/12°C,Inlet/Outlet water temperature:26°C/28°C. Note:All the data in the brochure is only for reference,designs and specifications might be changed without prior notice for.